Maura Beth McShay, library director in Cherico, Mississippi, is pregnant. So is her sister-in-law, Elise McShay, an unmarried professor of women’s studies. When the two women discover that they are experiencing similar doubts about the kind of mother they will be and how motherhood will change who they are, Maura Beth proposes a new group, Expecting Great Things, for the purpose of providing support to pregnant women. They extend invitations to all the Cherry Cola Book Club members, requiring only that all stories shared with the group be positive. At the first meeting, Maura Beth’s friend, Periwinkle Place, owner of the popular local restaurant The Twinkle, announces that she too is pregnant. The pregnancies of the three women serve as the focus of the book. Maura Beth is bothered by her husband’s tendency to share her pregnancy symptoms from morning sickness to food cravings and by friction with her mother over choosing a name for the baby. Elise, a single woman who has chosen to be impregnated by a sperm donor and plans to raise the child by herself, is uncertain how her conventional parents will react to her choice. Periwinkle, already semi-estranged from her racist mother who refuses to accept Periwinkle’s marriage to Parker Place, a black man, must now contend with Mama’s disapproval of her forty-two-year-old daughter’s pregnancy under any circumstances and her horror at the thought of a mixed-race child carrying her genes. The novel is high on community involvement and low-key humor and low on conflict. It is a feel-good book that includes lots of gatherings to share food, ideas, and lives. This is the sixth book in the Cherry Cola Book Club series, but it is my first book in the series and by this author. I found the book mildly entertaining, but I never really connected with the characters. 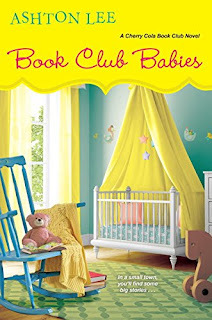 I imagine that fans of the series will love the finale with all the babies, the symbolism of spring, and the second-generation book club promise. For the foodies among us, the book includes quite a collection of Cherico recipes. I will have to check this series out. Pamela, it seems to be beloved by readers who have read the full series, but I don't think this one works as a standalone.